The researchers Estela Pereira, Teresa Monteiro (I3N), Rosario Correia (I3N) and Sérgio Pereira (CICECO), University of Aveiro (UA), have produced significant contributions to the advances performed in blue LED technology distinguished with the Nobel Prize in Physics award, from the Royal Academy of Sciences of Sweden, to the scientists Isamu Akasak,i Hiroshi Amano and Shuji Nakamura. The relevance of the work done by Portuguese researchers is evident in the work co-authored with the laureates and the quote they deserved in their research work that led to the Nobel Prize for Physics in 2014. The participation of the Physics Department in the research field of nitrides family materials for application in blue light-emitting diodes (LED), which was pioneer at the national level, goes back to the 90. In 1996, began the multidisciplinary and international project "Rainbow”, funded by the European Community, which was coordinated at UA level by Helena Nazaré and Estela Pereira. This project involved industry and universities in different European countries, and among other goals, was aimed to develop prototypes of blue LED and laser diodes. Following this project, have strengthened international networks of collaboration between scientists working in this area. Consequently, and resulting from the research capacity in terms of optical and structural characterization of semiconductor materials, in particular GaN and InGaN ternary alloy, which is the central emitting material of these devices, UA researchers have developed works where the also participated two of the Nobel laureates in Physics , , , one of which included in a chapter of a book in this field . Besides the co-authorships with two of Nobel laureates, there is still work led by the research team, authored by Sergio Pereira, Rosario Correia and Estela Pereira , which obtained direct recognition by the three laureates being quoted by these authors in an article published in Nature Materials journal. The quote from this work, whose conclusions were adopted today by the scientific community, frontally challenged the ideas instituted at the time and attests the quality and relevance of the research done in this field of knowledge in UA. The attribution of the highest award that exists in Science to Isamu Akasaki , Hiroshi Amano (Nagoya University, Japan) and Shuji Nakamura (currently at University of California, Santa Barbara, USA) for the remarkable work they have done within the creation of the first blue LEDs in the 90s, fits well in the spirit of its founder Alfred Nobel, since this findings in the field of applied physics generated significant impact on the day-to-day life of all humanity. The possibility of obtain emitted photons in this spectral region, through a device based on semiconductor materials led the way to obtain white light, allowing the creation of a much more efficient light technology at energy point of view and greater rationality in the use of materials. Energy efficiency and durability of these devices are in such higher order to conventional light sources that it is possible today to deliver light producing devices (eg coupling light emitting diodes to small solar cells) to regions of the planet where almost everything is lacking, namely a network of electric distribution. This award is also a tribute to the perseverance and the ability to believe of these scientists who took the risk of continuing to research in an area of materials that was practically abandoned by his peers on the 70s. 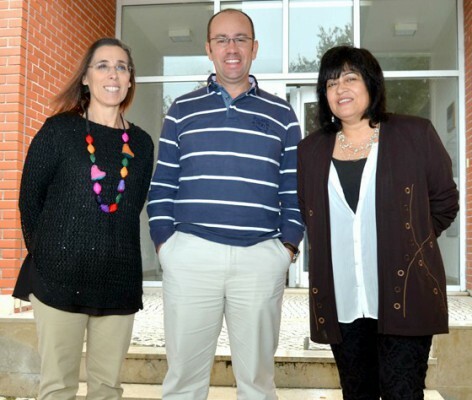 The researchers Teresa Monteiro and Rosario Correia integrate Institute of Nanostructures, and Nanofabrication Nanomodelling (I3N), while Sérgio Pereira is researcher at the Centre for Research in Ceramics and Composite Materials (CICECO). These scientists today continue to develop research in the field of optical and structural properties of multiple material systems that, hopefully, will have a positive impact on the future of mankind. - A. Kasic, M. Schubert, J. Off, B. Kuhn, F. Scholz, S. Einfeldt, T. Böttcher, D. Hommel, D. J. As, U. Köhler, A. Dadgar, A. Krost, Y. Saito, Y. Nanishi, M. R. Correia, S. Pereira, V. Darakchieva, B. Monemar, H. Amano, I. Akasaki and G. Wagner, physica status solidi (c), 0, 1750 (2003). - Phonons and Free-Carrier Properties of Binary, Ternary, and Quaternary Group-III Nitride Layers Measured by Infrared Spectroscopic Ellipsometry, by A. Kasic, M. Schubert, J. Off, B. Kuhn, F. Scholz, S. Einfeldt, T. Böttcher, D. Hommel, D. J. As, U. Koehler, A. Dadgar, A. Krost, Y. Saito, Y. Nanishi, M. R. Correia, S. Pereira, V. Darakchieva, B. Monemar, H. Amano, I. Akasaki, G. Wagner, in “Group III-Nitrides and Their Heterostructures: Growth, Characterization and Applications” edited by F. Bechstedt, B. K. Meyer and M. Stutzmann (Wiley-VCH, Berlin, 2003) ISBN 3-527-40475-9.